See our ad size and placement chart below, and then please feel free to contact us at JewishMusicReport@gmail.com to get your ad placed today! 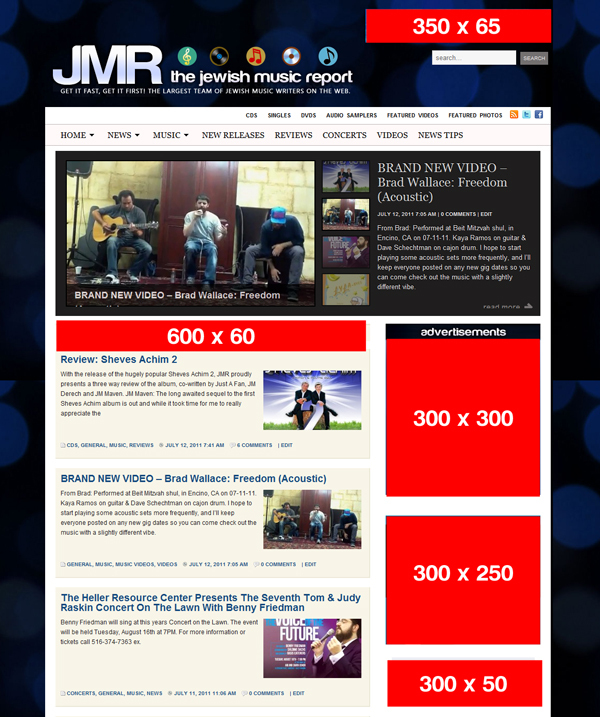 The Jewish Music Report is one of the only English, Jewish Music websites on the internet. Many other websites cover Jewish things, but we specialize in Jewish Music. We have a large pool of writers dedicated to covering the topic they love most, Jewish Music! We have a very diverse team of writers that offer opinions on anything from Moshav Band to Uncle Moishy to Miami Boys Choir. Over the last couple years we have steadily grown into a website that gets a large number of daily readers. These readers are very loyal and love to be part of the conversation. This is a great oppurtunity to promote your product or event to a base of people who are passionate about what they like. We know your advertising campaigns can add up real quick – which is why we also offer some of the lowest pricing for banner online! We have different spots to fit your different pricing options and we offer discounts for multi-month reservations.